In a word: On top and in front. JM and Nichole ate the shiitakes, coppa board, salmon, and dessert with a lemonade and a ginger beer. The bill was $45, plus a gift of shiitakes (thank you! ), plus tip. JM and Nichole gave Forequarter an A (see our grading rubric). It was a warm October day when we ate at Forequarter. By the time this post goes up, the weather and the menu will probably have changed. We've forgotten some details and will probably get even more facts wrong than usual, but Forequarter rewarded us for paying attention, regardless of what we actually understood about the experience. We hope you'll be forgiving. Within a few minutes of five, the dining room was starting to fill up. By the time we left at 6:30 it was standing room only and we felt we'd been a little selfish to sit so long, but we didn't feel rushed out. 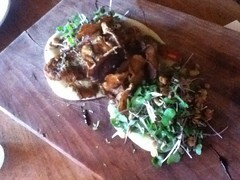 While we were poring over the menu, tackling the puzzle of which dishes to share, a plate of fried shiitakes appeared. It was a beautifully balanced board, with lime aioli, dots of vinegar, slivers of pickled hot peppers, nutty sprouted grains, and some of the microgreens growing in pots bolted to the walls. Not to mention the satisfying, meaty mushrooms themselves. Last Bite (before dessert) came from this plate. 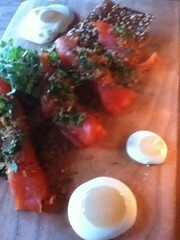 We settled on the smoked King salmon with "flavors of everything bagel" and a sausage plate. (We realized later that we hadn't picked super-seasonal items.) The salmon was fun and delicious. Four generous, tender slices of fish lay on top of a long thin cracker topped with - everything: sesame seeds, toasted onion, garlic, poppy seeds, plus more of the slightly spicy greens. Cute and functional sunny-side-up daubs of creme fraiche with pear sauce "yolks" were there for garnish. 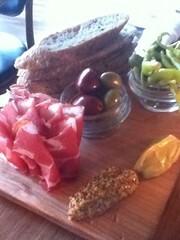 The sausage board came with ribbons of fatty coppa, bread, two mustards, olives, and pickles. The mustard was delicious on its own, but wasn't quite strong enough vs. the upstanding coppa. The bread was amazing bread, with a perfect chewy crust and a tender center. The salty sides were nice, hot peppers, small garlicky gherkins, and hearty olives. Everyone at Forequarter seemed excited to be there. As the meal went on, it slowly dawned on us that we were sitting in the middle of a bank of anniversaries. Even if it had been just another night, it was a special night. We were grateful to be there. I loved reading your review of Forequarter because it perfectly captured why it's such a great restaurant...the relaxed not rushed vibe (even when the place is packed), the feeling that everyone who is there (diners and employees alike)is happy to be there, and the incredibly delicious, seasonal, and artful food. The first time I dined at Forequarter, we sat at the bar. When it was time for dessert, the bartender poured some custard in a mixing bowl, added some liquid nitrogen, and whisked up our dessert of fennel ice cream right in front of us just like he was mixing a drink. 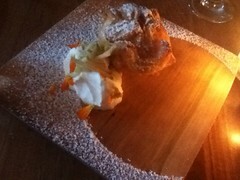 It was delicious, inventive, and not at all pretentious. I was sold on Forequarter from that point on, and have never been disappointed since. Forequarter has received a lot of national attention lately, and all of it has been richly deserved. This place is not over-rated. It's everything everyone says it is and more.